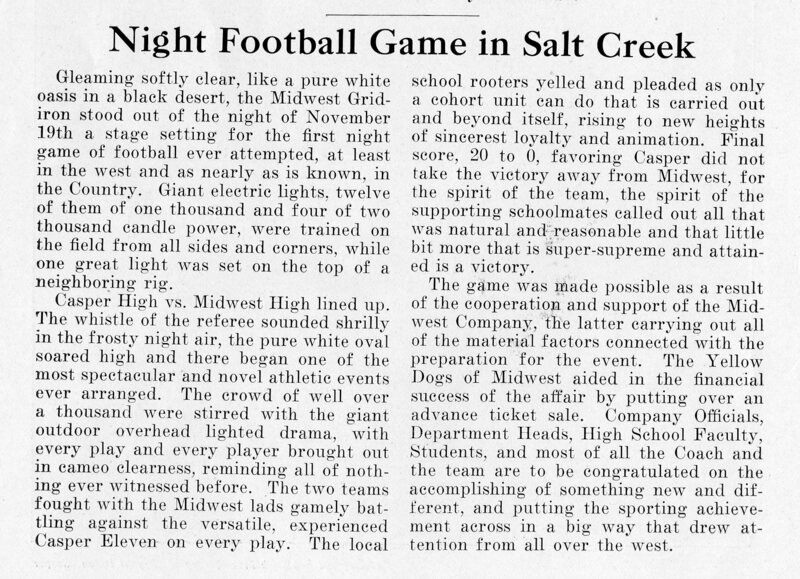 90 years ago today, the little town of Midwest, Wyoming, made high school sports history by hosting the first night football game. Midwest was a company town for the Midwest Refining Company. The Company prided itself on treating employees like family and invested much time and effort into moral and community building for the men and their families. Due to their schedules, few of the roughnecks were able to enjoy prep football games, especially as the daylight shortened in the late fall. Several artificially lit collegiate football games had been played, but in 1925, this technology had not been attempted at the high school level. At 7:30 pm on the night of November 19, 1925, the Midwest Yellow Dogs kicked off against the Casper High School team under the glare of twelve 1,000 candle electric lights, four 2,000 candle lights, “one great light… set on the top of a neighboring [oil] rig” and several smaller gas lights. The Company had purchased and erected the lighting apparatus and the team boosters used the profits from the presale of tickets to help offset the cost. Nearly 1,000 spectators watched the two teams fight over the white enameled football. In the end, the Casper team was victorious shutting out the home team 20-0.